Rusty Miller, a native Southern Californian, former United States Surfing Champion (1965) moved to Byron Bay Australia in 1970 and is Byron Bay’s original surfing teacher. He has lived, surfed, taught and written about surfing and advocated for the environment and the community since the early 1970s in Byron Bay. Having surfed around the world since the early 1960s Rusty uses surfing as the basis for his philosophy on life. 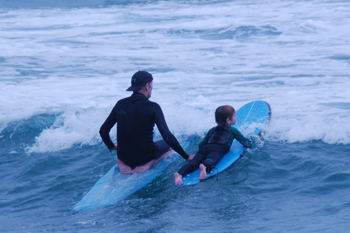 He believes that surfing is essentially an art form, and is the major cultural influence of his life. Rusty has had many surfing firsts in his life: surfing Ceylon, Lebanon, Israel, Egypt and Portugal in 1964/65/66. His image, taken by Dr. Don James, screaming down the face of a Sunset wave, was used as a billboard across America in the early 1960’s. 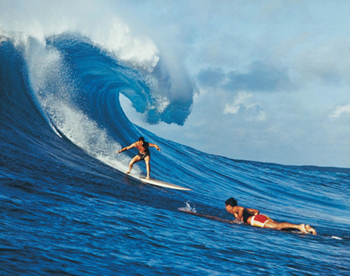 This photograph has inspired many people to surf and continues to be included whenever there is a world-wide round-up of iconic surf photos. In 1971 Rusty was the first to surf Uluwaatu, Bali, which was filmed as part of the cult Australian surf film, Morning of the Earth. His image – the silhouette of two surfers, boards under arms, looking at the surf, Rusty on the left – defines the film and the era of surf discovery in Indonesia. In 1973 he started the North Coast region’s first alternative newspaper, The Byron Express, and has been producing Byron Guides since 1984. In 2012 he co-wrote his first book Turning Point: Surf Portraits and Stories From Bells to Byron 1970-1971. Then came Turning Point II: Surf Portraits and Stories Hawaii: Oahu-Kauai-Maui 1968-1972. Rusty nose riding at Belongil, Byron Bay. Photo: Justin Bevan. Rusty & Bailey. Photo: Ross Parkinson. Rusty taking the drop at Sunset Beach. Photo: Dr. Don James.